When it comes to Thai cuisine, I have always been on the fence. Sometimes I enjoy it and sometimes I don’t. There’s something about its signature flavor of coconut, cilantro, and basil that overwhelms and confuses my palate. Until now, I cannot bring myself to love it yet I don’t find it detestable either. Despite these, I convinced my friends to try out Basil, a newly opened Thai restaurant along White Plains corner Katipunan Avenue. Since it sprang up sometime around February this year along a road that’s otherwise lined with garden supply stores, my curiosity slowly grew until I knew I had to go in and give it a go. Just the facade itself is interesting enough with its references to Thai architecture and minimalist signage. I though that Basil, being a staple in Thai cuisine, was a brilliant name for a Thai restaurant. 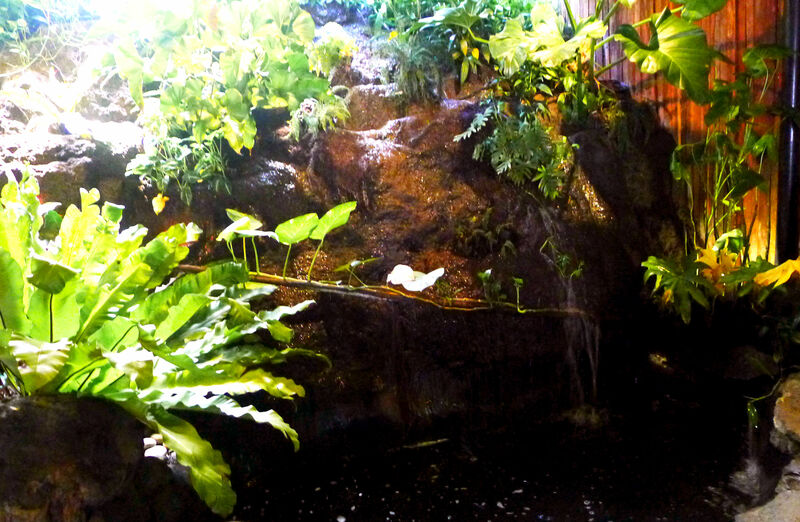 Stepping into the restaurant, the calming sound of moving water will greet you above the usual buzz from other diners. Also noticeable was the profusion of greenery inside the dining area plus a scattering of various knickknacks here and there. Apparently, Basil’s owners are plant and art enthusiasts hence the incorporation of these elements inside and even outside the restaurant. My friend Marko and I took advantage of the beautiful surroundings to snap some quick photos of ourselves and our outfits. 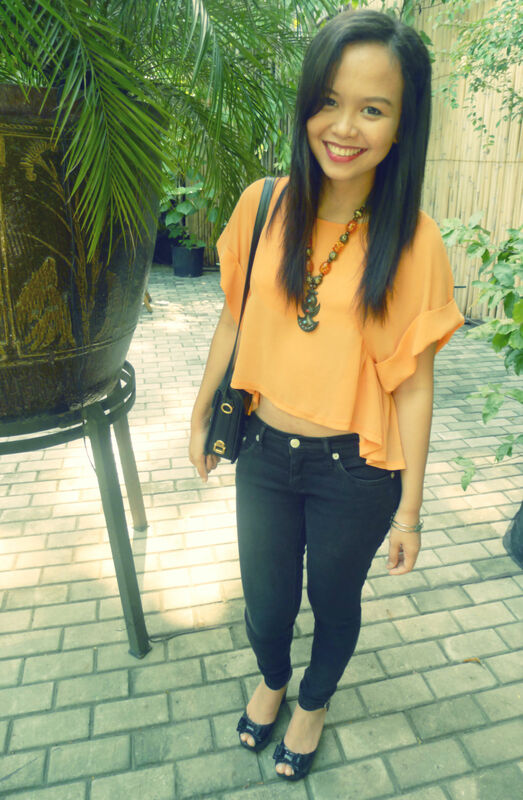 Staying true to the theme of the day, I accessorized my casual getup with a necklace from Bangkok. Marko, on the other, kept his look laid back in a plain T-shirt, Jeans, and Sanuk shoes. As much as possible, my friends and I picked the recommended items on the menu so for starters, we had the Thai Crispy Fish with Green Mango (Yam Pla – Duk Fu) salad. I really enjoyed the mixture of flavors and textures in this dish. Green mango, being a favorite of mine, I was prepared to like this dish on the spot. 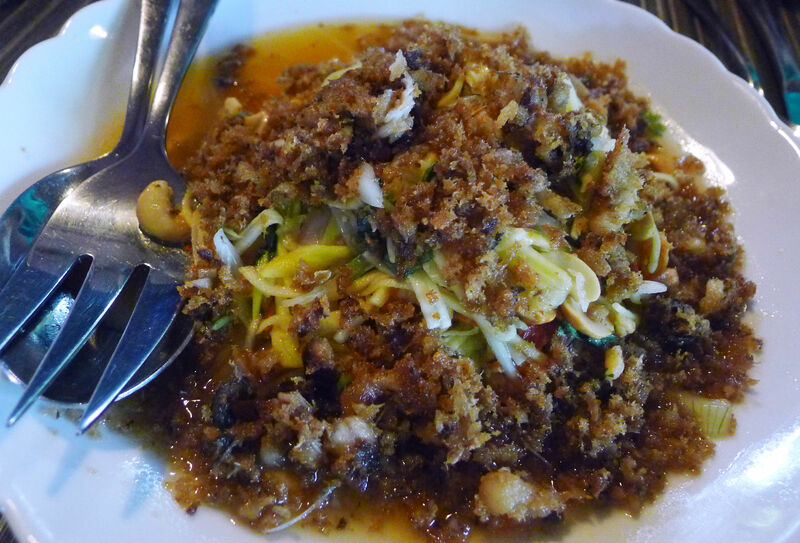 However, the fish and dried shrimps mixed in the salad was a tad to salty for our tastes. We had to take them out of the mixture otherwise, the saltiness would have made this dish inedible. Choosing the main course was a bit more difficult because there were so many different options. I wanted to try one of the curries but in the end, we went for a safer option – Grilled Pork Ribs with Honey (Moo Yang Nam Poung). In the end, I’m glad we went with this dish as the meat was so soft and savory just the way I like my meat. 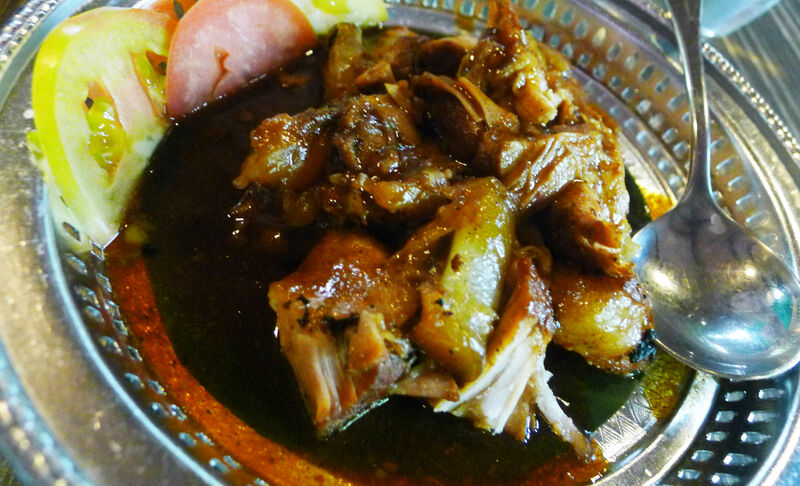 It reminded me a bit of beef brisket except that this one’s sweeter. If there was one thing I wished for this dish, it would be for them to serve this in bigger portions. This is definitely a dish I recommend. 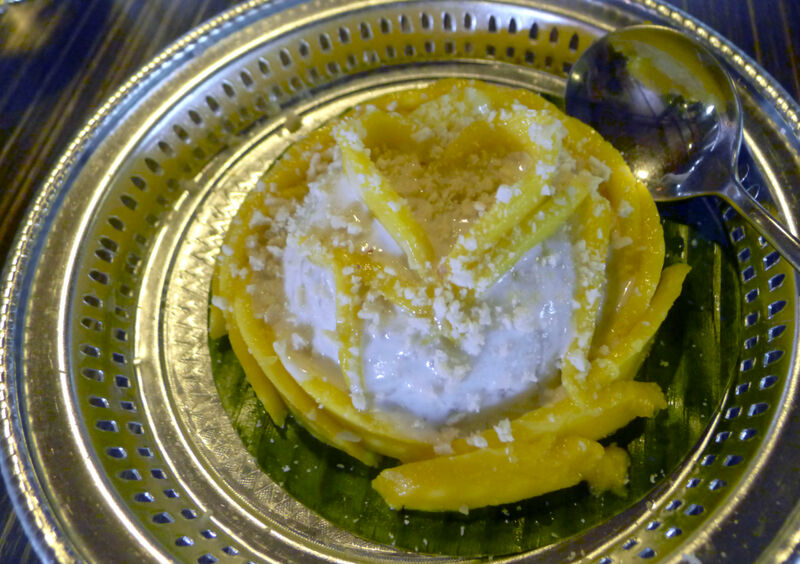 Last but not the least, a plate of Thai Sticky Rice with Mango (Khao Niew Ma Muang) was shared among us for dessert. Basically, it’s like the Filipino biko served with mango and a drizzle of coconut milk. I cannot help but compare it to Nav’s version, which I prefer. Theirs had a coconut milk dip, which added more flavor to the dish and made it more extraordinary. I got to give Basil props though for presentation. 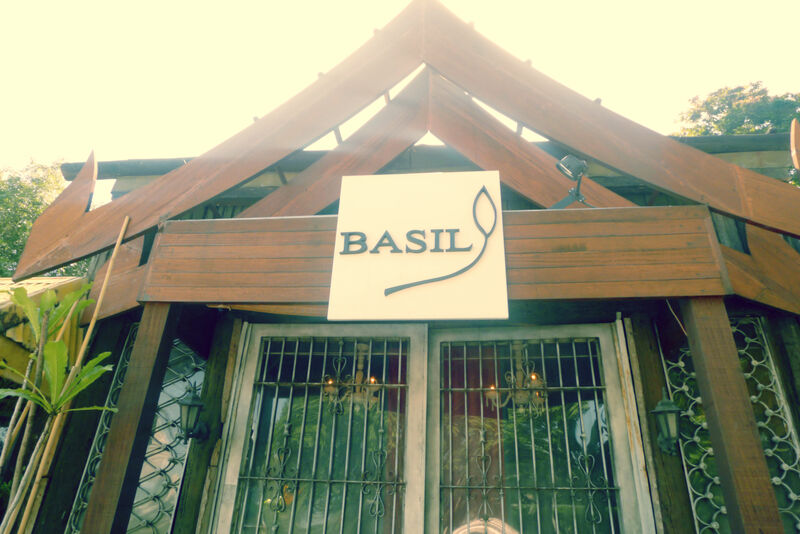 Overall, I think Basil is a great place for dates and special occasions. 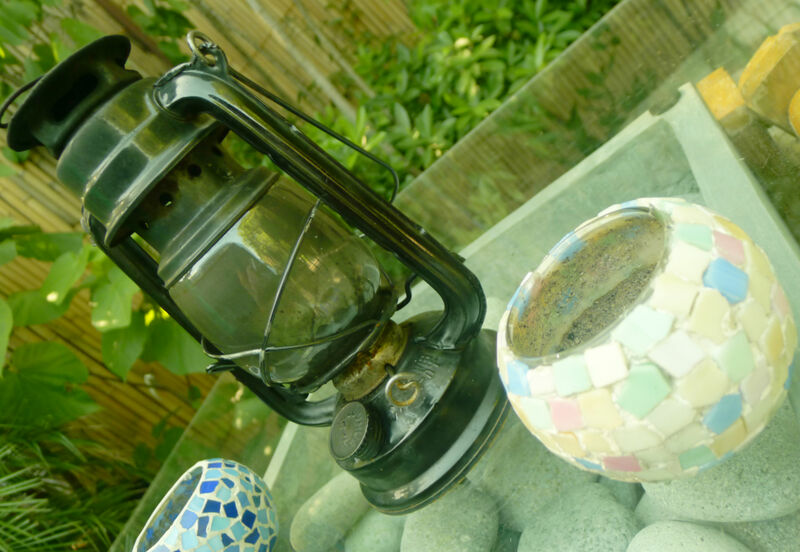 The ambiance and theme of the restaurant is impressive yet also intimate, which is perfect for such endeavors. I’d give the food a 3.5/5 but only because I am admittedly still on the fence about Thai cuisine in general. The price range is a bit expensive but reasonable especially when compared to other restaurants of this caliber. I couldn’t agree more. 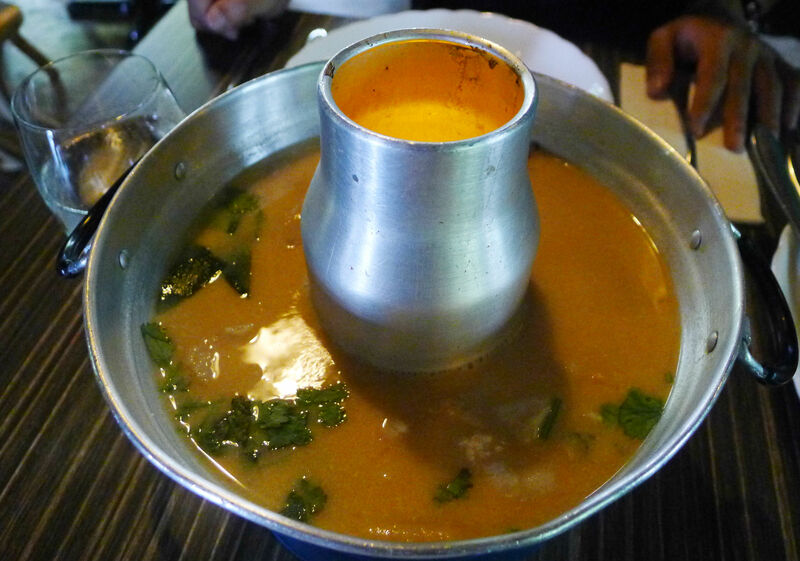 In fact, it’s that complexity that I’m still trying to wrap my head around and because of that, Thai food will continue to be a delight and surprise for me. What about you? 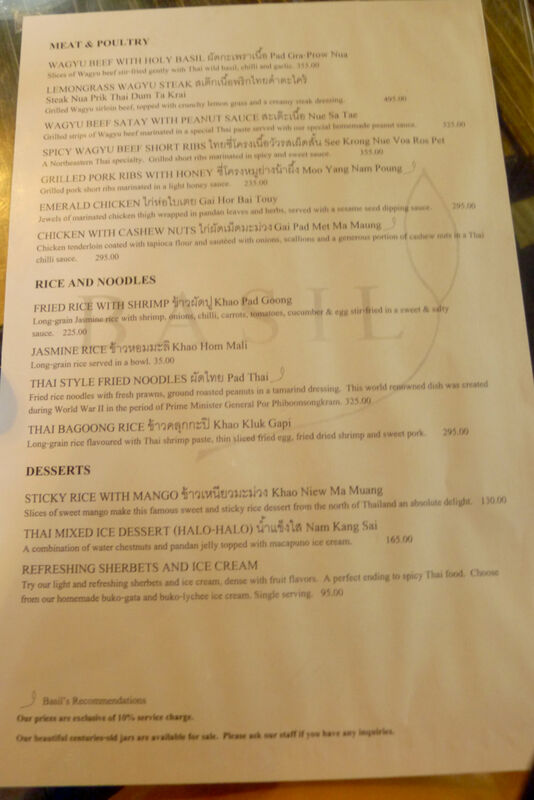 Any thoughts on Thai cuisine? hmm sarap!! this reminds me i have to post pa about a thai resto i’ve recently tried! 🙂 actually the quote you included is so true.. thai cuisine “ain’t about simplicity”! Looks delish! I love Thai food. Yummm yumm!! I haven’t started exploring Thai cuisine yet. I’ve only eaten in one, and although it was a good experience, I felt as if the food was too tangy for my stomach. However, my palate really enjoys the fusion of bold flavors in Thai food. Hopefully I get to try Basil too. 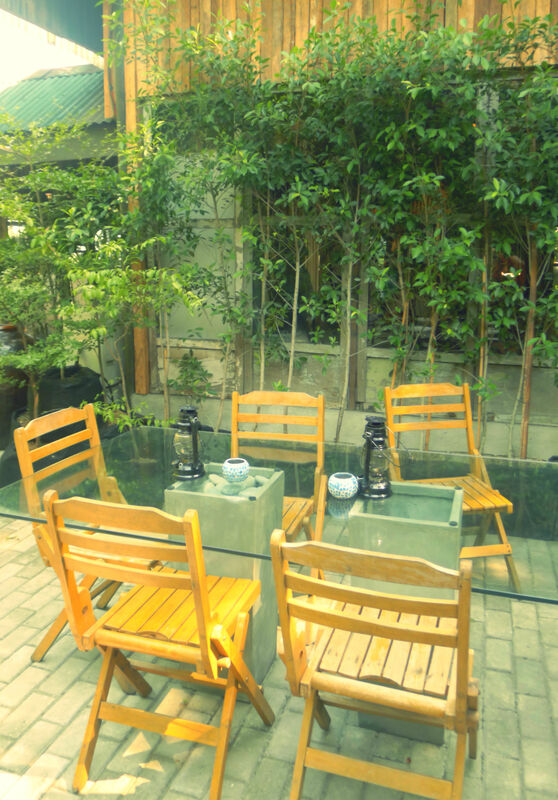 I just love how refreshing the place looks like and how enticing those dishes seem to be! 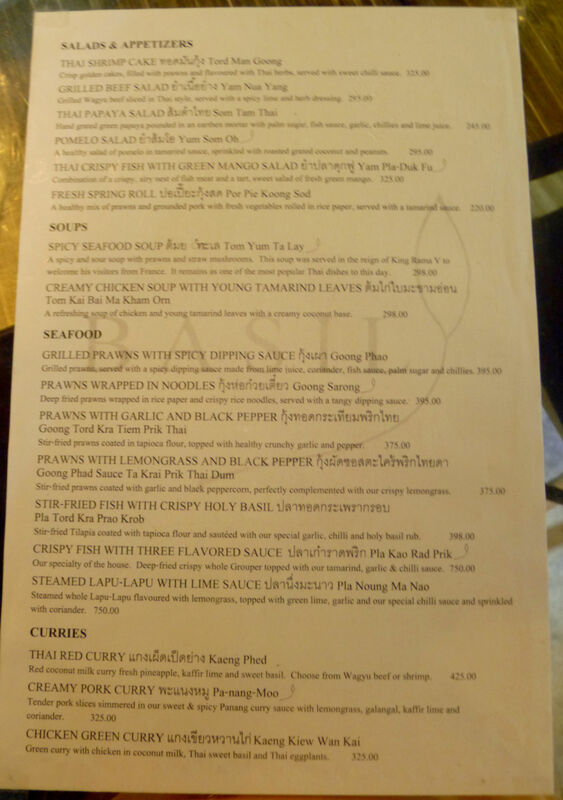 I was never a fan of thai cuisine..I tried it once but really didn’t appreciate the food. 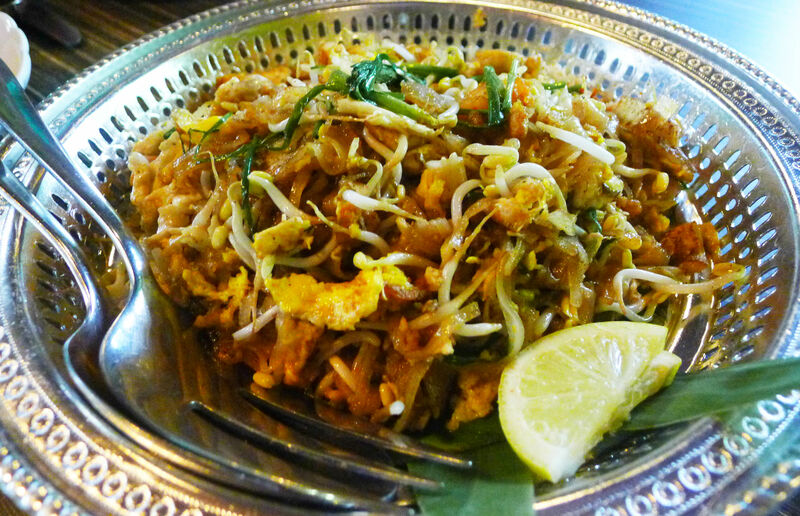 I may have had thai food somewhere along the way, unaware I was eating thai dish already. 🙂 But I wouldn’t mind trying it again as long as I’m not paying. lol! Cute outfit btw!